JoAnn has over 40 years performing experience in various bands, stage orchestras, and drum & bugle corps. She has performed in venues such as the Eastern States Exposition for four seasons, four cruises to Bermuda for Celebrity Cruise Lines, the Centrum in Worcester, and other venues throughout New England and New York. She is a member of the "Sunny Side Swing Group" with M&A colleague Randy Scaletta. She has been at this location for over 20 years teaching drum set and percussion, and holds a private studio in the Westborough area. 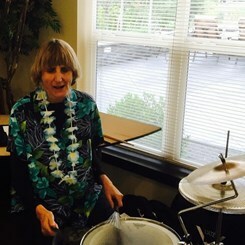 JoAnn holds regular camps with bucket bands and drum lines in the summer. She taught drum & bugle corps in Worcester and Leicester, MA, for 10 years. She studied many years with mentors Phil Salah, Larry Hough, Don Chalifoux, and Dave Vose. "I teach rock, country, jazz, and concert performance with a concentration on rudiments and sight reading. I have my students select some of the music to learn in order to keep their interest in playing strong. I run special classes during the year (drum line and school of rock) in order to teach students to work together in order to make good music. This also demonstrates to students and parents just how much fun music can be. If they enjoy music, they will stick with it." Request Lessons with JoAnn today!